The boys and I ventured out to the mall yesterday with Holly and her crew. 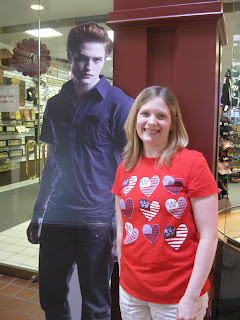 When Holly pointed out Edward I knew I had to get my picture taken with him for the sole purpose of getting a reaction out of my husband. It was worth it. I got an "Oh....(mumble, muble.)" and then he just started to laugh. Holly and I decided after the fact I should have tried to have a more serious look to match Edward's or maybe I should have tried to kiss him... Oh well, maybe next time. He he...you two make a lovely couple.